For other uses, see Omai (disambiguation). Ma'i described himself as a hoa, chiefly attendant, the son of a Ra'iatea landowner. His father was killed by Puni's Borabora warriors. Fleeing to Tahiti, Ma'i was wounded in the encounter with the Dolphin in 1767. Ma'i then became an apprentice to a priest. Returning to Ra'iatea, he was captured and taken to Borabora. Narrowly escaping death there, he escaped to Huahine. Omai met Samuel Wallis in 1767 and Captain James Cook in 1769 in Tahiti. 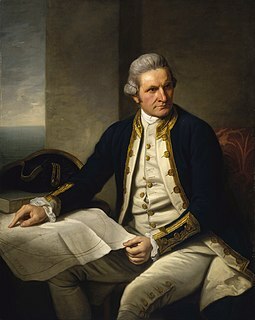 In August 1773 he embarked from Huahine on the British ship HMS Adventure, commanded by Tobias Furneaux, which had previously touched at Tahiti as part of Cook's second voyage of discovery in the Pacific. Omai travelled to Europe on Adventure, arriving at London in October 1774 where he was introduced into British society by the naturalist Sir Joseph Banks (whom he had also met during Cook's first voyage). During his two-year stay in England, Omai became much admired within London high society. Renowned for his charm, quick wit and exotic good looks, he quickly became a favourite of the aristocratic elite. Banks regularly invited Omai to dine with the Royal Society and arranged meetings with notable celebrities, including Lord Sandwich, Dr Samuel Johnson, Frances Burney, and Anna Seward, among others. Richard Holmes remarks that Omai's idiosyncratic behaviour and distinctive bow were widely celebrated. Indeed, during one famed meeting with King George III at Kew, Omai is said to have delivered his bow then grasped the King's hand, declaring, "How do, King Tosh!" 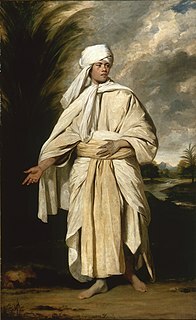 He was painted by Sir Joshua Reynolds, among others; Portrait of Omai sold in 2001 for "the second highest price ever paid for a British picture", according to the Antiques Trade Gazette. Omai's journey to England and subsequent return to Tahiti with Cook's third voyage in 1776 became the subject of a theatrical production, written and directed by the dramatist John O'Keefe, entitled Omai – A Voyage ‘round the World that was performed during the 1785 Christmas season at the Theatre Royal in Covent Garden. Omai returned to Huahine in August 1777 and was settled with a European-style house, furniture, vineyard and two Maori boys as his servants. During the Bounty's visit to Tahiti in 1789, Captain Bligh was told Omai had died about two and a half years after Cook's departure in November 1777. Wikimedia Commons has media related to Omai. ^ Salmond, Anne (2010). Aphrodite's Island. Berkeley: University of California Press. pp. 283–284, 389–402. ISBN 9780520261143. ^ Quanchi, Max (2005). Historical Dictionary of the Discovery and Exploration of the Pacific Islands. The Scarecrow Press. p. 200. ISBN 0810853957. ^ "The strange case of the dealer who went over the top". www.antiquestradegazette.com. 13 Dec 2001. Retrieved 29 December 2018. ^ "Temporary Export Bar For 'Outstanding' Reynolds' Portrait Of Omai" (Press release). United Kingdom Department for Culture, Media and Sport. 17 December 2002. Archived from the original on 27 July 2008. Retrieved 6 December 2008. Prince Ari'imate Teururai later known as King Tamatoa VI, was a member of a Tahitian royal family, the House of Teururai which reigned on the Tahitian island of Huahiné and Maia'o during the 19th century. 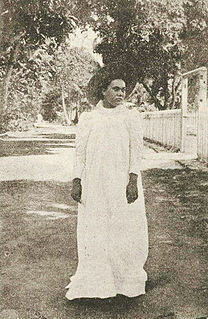 Princess Teri'i-na-vaha-roa was the last sovereign monarch of the Kingdom of Huahine and Mai'ao from 1893 to 1895. Comteporary sources seems to call her Tehaapapa II instead, disregarding the ruling queen by the same name at the time James Cook visited the island. Maerehia of Raiatea and Tahaa, was a princess of Raiatea and Tahaa from the Tamatoa dynasty family, a Polynesian royal family. 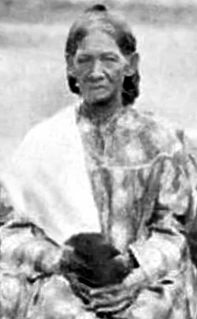 She was wife of Ari'imate of Huahine, founder of the Teururai dynasty which reigned on the Tahitian island of Huahiné and Maia'o during the 19th century. She was Queen of Huahine and Maia'o and later Queen regnant in her own right. Comteporary sources seems to call her Tehaapapa I instead, disregarding the ruling queen by the same name at the time Captain Cook visited the island. Tropical Cyclone Alan was considered to be one of the worst natural disasters experienced in French Polynesia. The system, first noted as a tropical disturbance on April 17, 1998 east of the Northern Cook Islands, initially moved erratically prior to its designation as Alan upon developing into a tropical cyclone on April 21. The following day, Alan reached its estimated peak intensity with 10-minute maximum sustained wind speeds of 75 km/h (45 mph), posing several forecasting challenges due to difficulties in establishing its location and intensity. On April 23, Alan appeared to become sheared with the low-level circulation center displaced about 20 km (10 mi) from the nearest atmospheric convection. However, over the next day, after the mid-level trough of low pressure shearing the system moved faster than expected, Alan became better organized. While situated about 555 km (345 mi) west-northwest of the French Polynesian island of Tahiti, the system drifted south-southeastward. Early on April 25, Alan passed near to or over the French Polynesian Society Islands of Maupiti, Bora-Bora, and Raiatea. However, strong wind shear pulled the system apart, with visible imagery confirming the system's degeneration into a depression with a fully exposed low-level circulation. The system affected French Polynesia with high winds and torrential rain, causing several landslides on the Society Islands. The landslides resulted in the collapse of two bridges, and also overturned trees, in turn obstructing roads. Overall, ten people died as a result of the system, while thirty others were injured, with a majority of the casualties a result of landslides. On the islands of Raiatea, Taha'a and Huahine, several churches, schools and clinics were damaged, while water and electricity supplies were cut off. On the islands, around 750 houses were destroyed, with 430 and 150 wrecked on Huahine and Ra'iātea, respectively. Portrait of Omai is an oil-on-canvas portrait by English artist Sir Joshua Reynolds, completed c.1776.